At this time of year there is so much seasonal veg and fruit coming onto the market in Hertfordshire and it is great to be able to buy it fresh and local. If you haven’t yet visited why not find out more about the local Harpenden Farmer's Market which takes place on the 4th Sunday of each month from 10.00am to 2.00pm. Harpenden Farmers' Market accommodates about 70 stalls and runs Northbound along the Lower High Street from Sainsbury’s Supermarket. There you can expect to find local specialities, mouth-watering cheeses, seasonal fruit and vegetables, load of lovely fresh herbs, top quality meat and game, dairy produce, and eggs including some organic produce. You will also find a huge selection of other local products for sale from pickles, jams and honey, to arts and crafts. There is also the opportunity to source local plants and flowers for the garden and fresh bread cakes and pastries for the kitchen table. The next Harpenden market is on Sunday 26 June 2016. But if you want to check out the St Albans’ Farmers Market before then it’s held on St Peters Street on the 2nd Sunday each month from 8.00am to 2.00pm. 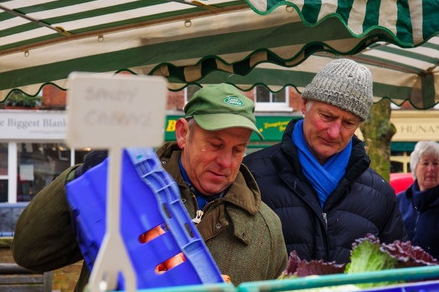 Local Hertfordshire Farmers' Markets help local farmers, growers and producers to sell their own produce, direct to the public and a regulated farmers market provides fresh, safe, natural, nutritious food that you can trust. In addition it offers a vibrant and entertaining shopping experience in the beautiful surroundings of Harpenden or St Albans.